Download "Topics Covered on Geometry Placement Exam"
8 16) 17) Find the value of x that makes N the incenter of the triangle. 18) Use the diagram of triangle ABC where D, E, and F are the midpoints of the sides. 9 19) 20) Find the value of x. 21) Suppose that J is the incenter. Show your work. Find the value of x. Find the length of AG. Find the length of JK. 22) Point S is the centroid of triangle PQR. Use the given information to find the value of x. 11 27) Find the area of the triangle, round your answer to three decimal places. 28) Decide whether the numbers can represent the side lengths of a triangle. If they can, classify the triangle as acute, right, or obtuse. a) 26, 35, 62 b) 14, 18, 29 c) 30, 72, 78 d) 17, 19, 22 29) Find the value of the variable. 13 31) A symmetrical canyon is 4850 feet deep. A river runs through the canyon at its deepest point. The angle of depression from each side of the canyon to the river is 60 o. Round to the nearest thousandth. a) Find the distance across the canyon. b) Find the length of the canyon wall from the edge to the river. c) Is it more or less than a mile across the canyon? (5280 feet = 1 mile) 32) Find the length of AB. c) 33) Find the value of x. Show your work! 14 c) d) e) f) 34) Find the sum of the measures of the interior angles of the indicated convex polygon. a) Dodecagon b) 24-gon 35) Find the value of n for each regular n-gon described. a) Each interior angle of the regular n-gon has a measure of 162 o. b) Each exterior angle of the regular n-gon has a measure of 5 o. 15 36) Find the value of x, and the measure of the missing angles. 37) The side view of a storage shed is shown below. Find the value of x. Then determine the measure of each angle. 38) 39) Find the length of the midsegment of the trapezoid. 20 50) Find the value of x. c) 51) What is the center and radius of a circle with equation (x+5) 2 +( y 2) 2 =100 52) Find the area of the shaded region. Round answers to three decimal places, if necessary. 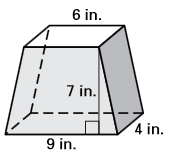 22 56) Find the volume of the right prism. Round your answer to two decimal places, if necessary. 57) Find the volume of the right cylinder. Round your answer to two decimal places, if necessary. 58) Find the volume of the solid. Round your answer to two decimal places, if necessary. 59) Find the radius of a sphere with the given surface area S.
25 15) a) Midsegment: joins the midpoints of two sides of a triangle such that it is parallel to the 3 rd side of the triangle. b) Midpoint Formula: ( x 1 + x 2 2, y 1 + y 2 2 ) c) Distance Formula: d = (x 2 x 1 ) 2 +( y 2 y 1 ) 2 d) Perpendicular Bisector Theorem: If a point is on the perpendicular bisector of a segment, then it is equidistant from the endpoints of the segment. e) Converse of Perpendicular Bisector Theorem: If a point is equidistant from the endpoints of a segment, then it is on the perpendicular bisector of the segment. f) Angle Bisector Theorem: If a point is on the bisector of an angle, then it is equidistant fromt eh two sides of the angle. g) Converse of Angle Bisector Theorem: If a point is in the interior of an angle and is equidistant from the sides of the angle, then it lies on the angle bisector. h) Circumcenter: Point of concurrency of the 3 perpendicular bisectors of a triangle. i) Incenter: Point of concurrency of the 3 angle bisectors of a triangle. j) Concurrency of Perpendicular Bisectors of a Triangle Theorem: The perpendicular bisectors of a triangle intersect at a point that is equidistant from the vertices of the triangle. k) Concurrency of Angle Bisectors of a Triangle Theorem: The angle bisectors of a triangle intersect at a point that is equidistant from the sides of the triangle. l) altitude: The perpendicular segment from a vertex to the opposite side or the line that contains the opposite side. 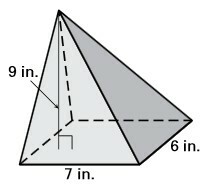 m) median: A segment from a vertex to the midpoint of the opposite side. n) centroid: The point of concurrency of the three medians of a triangle. o) orthocenter: The point of concurrency of the three altitudes of a triangle. p) Concurrency of Medians of a Triangles: The medians of a triangle intersect at a point that is 2/3 the distance from each vertex to the midpoint of the opposite side. q) Concurrency of Altitudes of a Triangles: The lines containing the altitudes of a triangle are concurrent. 27 38) 39) 19 40) 88 o 41) a) x = 14 b) x = ) 88 o 43) a) Scale factor: 5 2 b) Scale factor: enlargement reduction x = 20 x = y = ) c) 45) A 46) a) r= 8 3 b) x=± 2 3 c) x= 1 d) x= ) a) 115 o b) 55 o 48) a) x=25 y=22 b) x=7 y=14 49) a) 55 b) x = 34 c) x = 3 d) x = 21 e) x f) x = 4 50) a) x = 2 b) x = 3 c) x = 14 51) Center: ( 5, 2) Radius: 10 52) a) square units b) square units 53) cm (or 2π ) 54) a) about 47.6% b) about 56.95% 55) 5184 ft 3 56) a) yd 3 b) 210 in 3 57) yd 3 58) a) in 3 b) 126 in 3 59) 1 ft 60) 144 π ft 2 61) The surface area of Pluto is about 1 30 of the Earth's surface area. *1. Understand the concept of a constant number like pi. Know the formula for the circumference and area of a circle. Vertex : is the point at which two sides of a polygon meet.